Hycore was established by the invention of an innovative dual motor system by a Ph.D student studying robotics. Where do I contact for investment inquiries? Who is the CEO of Hycore? Hycore’s CEO, Harold Park, majored in computer programming. He started his first software, copy rights protection business when he was 24 and successfully executed the business for 8 years. Then, he entered GfK, a German marketing firm, where he mastered global marketing and market researching. Before he established Hycore, he entered Han Yang University of South Korea to manage technology business development within the university. All this eventually led him to be the right man for Hycoe with expertise in technology development and marketing. I want to work at Hycore, where do I begin? Contact info@hycore.com for job recruit inquiries. What does Hycore value the most? We value “people”. We want to provide people with what they need in its best form. We want our products to reflect human values and emotions. What’s Hycore’s next development plan other than Hycore T1? We are a electric motor engineering company. Therefore, anything related to motor system is what we plan to pioneer. Other than Hycore T1, we plan to develop motor system and motor kit business. With that, we hope to expand out business into larger scale motor system such as the ones in electric motorcycle, industrial & consumer appliances, and electric cars. How do I check if Hycore T1 will fit on my bicycle? Hycore T1 will fit on bicycles with rear axle width of 130mm or 135mm. Is Hycore T1 water proof? Yes, Hycore T1 is ater proof to endure moderate water exposures such as rain and snow. However, riding a bicycle on a wet surface is never a good idea. What wheel sizes are available for Hycore T1? Currently, Hycore T1 is made for 700C wheels with road-bike tires, and 26″ wheels with mountain tires. Depending on the demand, we plan to offer different sizes in the future, so stay connected with us if 700c wheel or 26″ wheel is not the right fit for you. What brake types are compatible with Hycore T1? Along with most other all-in-one wheels, Hycore T1 is only compatible with rim brakes, also known as V-brakes and caliper brakes. Can I just use Hycore T1 as a regular bicycle wheel? 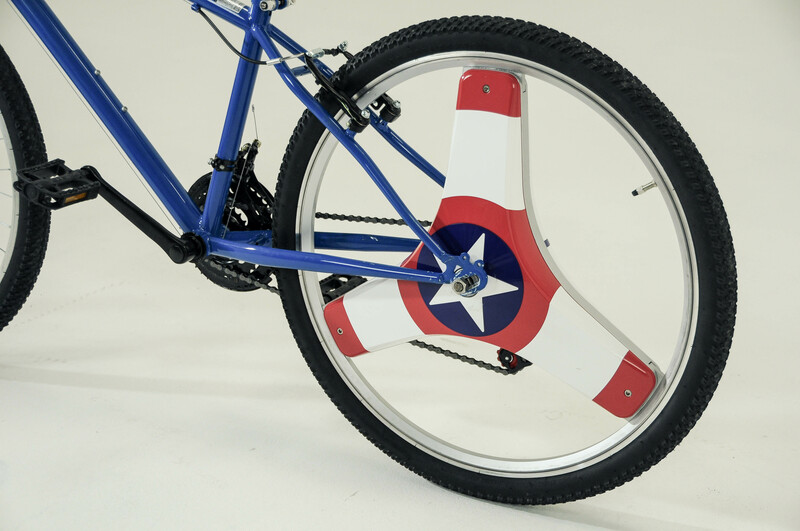 Yes, you can always just pedal and use it as a regular bicycle wheel. If you want to use the wheel as a regular bicycle wheel, you should detach the motors and the battery to reduce weight. Is the Hycore T1's case customizable? Yes! With some additional cost, you may customize your Hycore T1’s appearance! How do I operate Hycore T1 on a bicycle? Hycore T1 utilizes Pedal Assist System which makes it operate automatically as you pedal. Depending on your region, you may purchaase an exclusive wireless throttle to operate the wheel. Once the throttle is ready, we will update you about it. How does the PAS work on Hycore T1? By using a torque sensor, Hycore T1 will calculate the amount of force from the pedals and operate the motors accordingly, Once you start to pedal, you will feel the motors kick in. How is the weight balance on Hycore T1? Each spoke of the wheel is weight-balanced with repeated mechanical & physical testing. Depending on terrain and riding style, the detachable battery can last up to 2~4 hours when its fully charged. What type of batteries does Hycore T1 use? CENTINEL Wheel uses lithium-ion batteries. It takes 2~3 hours for the battery to fully charge. Remove the cover on the wheel and simply pull out the battery from its socket. How do I use the application for Hycore T1? Once you download the app, sign up and log in. Next, connect your Hycore T1 with the app via Bluetooth. How do I use the lock system in the app? Once you are logged in, connect your Hycore T1 with the app via Bluetooth. Next, press lock button on the main screen. How long does the warranty last for Hycore T1? Hycore T1 comes with 1 year warranty from the date of your purchase. Where is the customer service center for replacement parts & maintenance? Our customer service centers is located in Los Angeles, USA and Seoul, South Korea.